Peach me, I must be dreaming. Panama Peach is rated 4.4 out of 5 by 7. 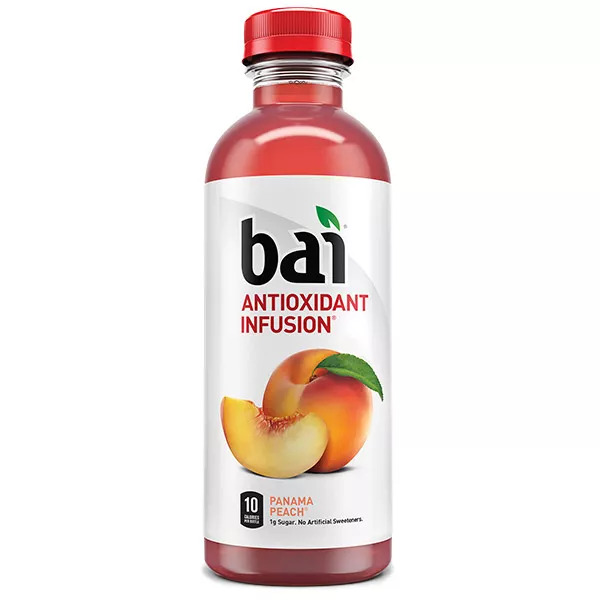 Given the fact that this is a 5-calorie per serving antioxidant-infused beverage with no artificial sweeteners, we’re tempted to call it a tasty dream. Maybe it’s a flavorful fantasy. But a fantasy that’s come true. So really it’s a reality. But a hard-to-believe reality because it’s so unspeakably flavorful. Which brings us back to where we started: Peach me, I must be dreaming.We named our flavors after the coffee growing regions that inspired them, sort of like French Kissing or Bermuda Shorts. Learn about these regions and more here. This simple spin on a flavorful Spanish cocktail adds pizzazz to any gathering. When the fizzy bubbles of sparkling wine meet your tongue with the subtly sweet flavor of Panama Peach and the fuzzy, juicy texture of peaches and raspberries, you'll swear your tastebuds are in a tickle fight. Place slices from from 2 ½ peaches into pitcher, and add 6 oz raspberries. Fill pitcher with both bottles of Bai Panama Peach and ½ bottle of champagne. Gently mix with wooden spoon, being careful to respect the bubbles! Place pitcher in refrigerator for 30-60 minutes, while the fruits infuse their flavor. Pour the remaining 2 glasses of champagne into flutes, arrange remaining 4 peach slices and handful of raspberries on a platter with baked brie and gluten free crackers (Costco sells these now! ), and spend some QT with your sous chef. 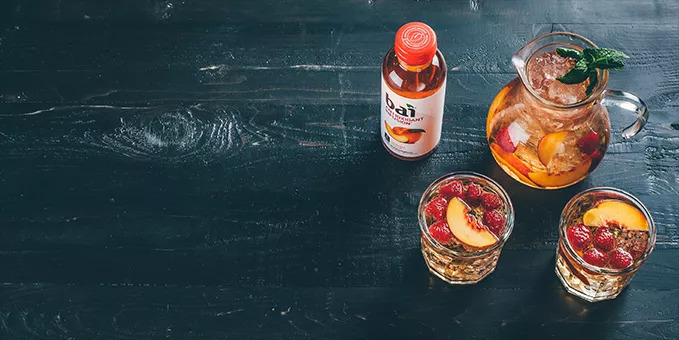 Filtered water, Bai® Proprietary Sweetener Blend™ (erythritol, stevia extract), peach juice concentrate, natural flavors, coffeefruit extract, citric acid, fruit and vegetable juice (for color), white tea extract, ascorbic acid, sodium citrate. Rated 5 out of 5 by Catsnrats from Tastes just like a peach! The peach is my favorite, but it is hard to find! True peach flavor. Rated 5 out of 5 by Jr2010 from Very good I bought it and love it. Smells and taste peachy. I cannot find it now....? Rated 5 out of 5 by Zmulaaa from BEST FLAVOR YET I use the Panama Peach flavor for everything! I use this to mix with my protein shakes, to create flavorful cocktails, and to drink as is. It tastes perfectly refreshing and doesn't taste too fake surgery. Rated 5 out of 5 by zoel from *chef's kiss* I don't drink soda or juice, strictly a water drinker, but this Panama Peach Bai is amazing. When I go to the store I buy so many because I can't get enough. I dare say, it is better than Snapple peach tea. Rated 5 out of 5 by KandaceBrooke from My Absolute Favorite Love these drinks so much! Packed with flavor, without the calories or artificial sweeteners. 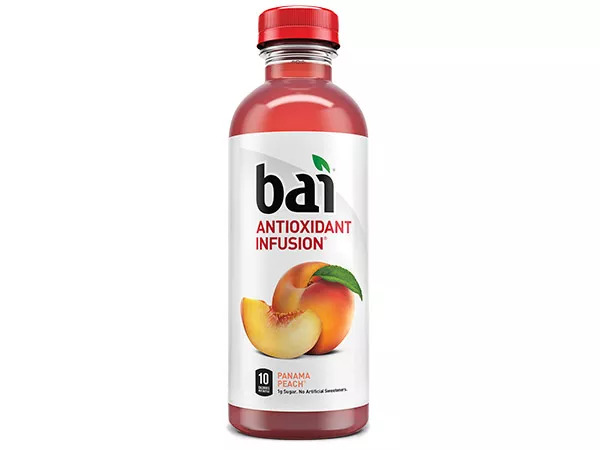 I try to drink mainly water but get tired of it easily so Bai drinks have been a saving grace. They allow me to enjoy a flavorful beverage guilt free!